Temporomandibular joint dysfunction, also known as TMJ disorder, is a very common condition involving persistent jaw pain and restricted movement of the muscles surrounding the jawbone. At Trillium Dental in Ottawa, we commonly treat patients with TMJ disorder and help them realign their jaw to its proper placement using a transcutaneous electrical nerve stimulator (TENS) unit and a custom-made orthotic. This TMJ treatment allows us to identify your ideal alignment and create a personalized mouthpiece for you to wear in order to retrain your jaw into its natural position. Though TMJ disorder is very common among adults, not everyone knows what the causes and symptoms are, leading many to live with it and not seek treatment. At Trillium Dental, we strongly encourage patients to visit our Ottawa dental clinic if they are experiencing any kind of TMJ pain, as this could be indicative of a more serious issue. In most cases, TMJ disorder is nothing more than a jaw misalignment, which can easily be readjusted with specialized dental care. That being said, here are some factors that may have had a role in your TMJ disorder. According to the Canadian Dental Association, there are many causes of TMJ disorder, and each type of disorder has its own set of consequences. Those who experience pain in the muscles around the temporomandibular joint, for example, may experience different symptoms than those who suffered a jaw injury while playing sports. 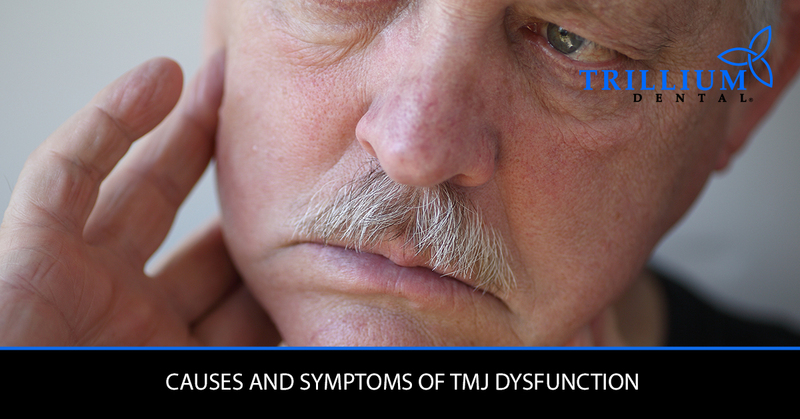 Nevertheless, some of the most common symptoms of TMJ disorder include the following. If you are experiencing any of the symptoms of TMJ disorder listed above, such as persistent jaw pain, jaw popping, or restricted jaw movement, it’s worth a trip to your local dental clinic to find out whether or not you have a TMJ disorder. Contact us today to learn more about our neuromuscular dentistry services, and book your dental appointment today at Trillium Dental in Ottawa. We look forward to helping you live a life free of jaw pain!